In 2017, the price of Bitcoin not only reached parity with gold, but promptly skyrocketed to a series of all time highs throughout the year. More recently, the yellow metal is valued at approximately $1310.00 per ounce, while Bitcoin made a run at the psychological barrier of $20,000 not that long ago. Throughout H2 2017 and continuing into 2018, the cryptographic tokens mania has caused more and more commodity traders to be interested in the concept of gold-backed cryptocurrencies. The combination of transparent and decentralized blockchain technology with a safe haven in the form of psychical gold has helped ensure the stable growth of token worth based on the valuable bullion. A digital coin represents the value of gold (for example one unit corresponds to ten grams), which is kept by the issuer, as a security for the cryptographic token’s value. In a rather large simplification, this works on the same principles as the gold standard, withdrawn from global financial markets back in the 1970s. Recently, a growing number of companies are trying to offer investors access to this interesting type of “gold” crypto-assets. Finance Magnates’ research team decided to select some of the most promising projects that are still under development and compare them in the terms of most important features for potential initial coin offering (ICO) backers, such as token economics, whitepaper, the team behind the project, etc. The final choices fell on Aurus, Darico, GoldCrypto, and Xgold. At first glance, the aforementioned projects may seem very similar, each offering various forms of gold value hedging. Each of these projects also utilizes Ethereum blockchain technology and plans their main ICO campaign aimed at gathering the necessary funds to develop the further phases of the project in 2018. In the following sections of the article, we take a closer look at the details of the tokens presented in the table above. Aurus aims to be a bridge between the traditional gold market and the new, crypto economy. To accomplish this, the group is harnessing blockchain technology to create a simple yet effective gold backed cryptocurrency accessible to individuals and organizations all over the world to own, trade and use – according to the company’s statement. AurusGOLD (AWG) tokens are backed by 99.99 LBA approved gold, redeemable at any time through the Asset Reconstruction Smart Contract and 100 percent liquid to fiat currencies or physical bullion gold. The company wants to present another token called AWR, which will distribute transaction fees of all Aurus Asset tokens (starting currently with AWG and then adding additional commodity-backed coins). The Aurus project is backed by two co-Founders, Stefan Gergely (blockchain evangelist) and Dan Cearnau (cryptocurrency solutions). The development team is also using the knowledge and experience of two external advisors, Deryck Graham and Johnny Verkuringen, gold trader and founder of the European Gold Standard. 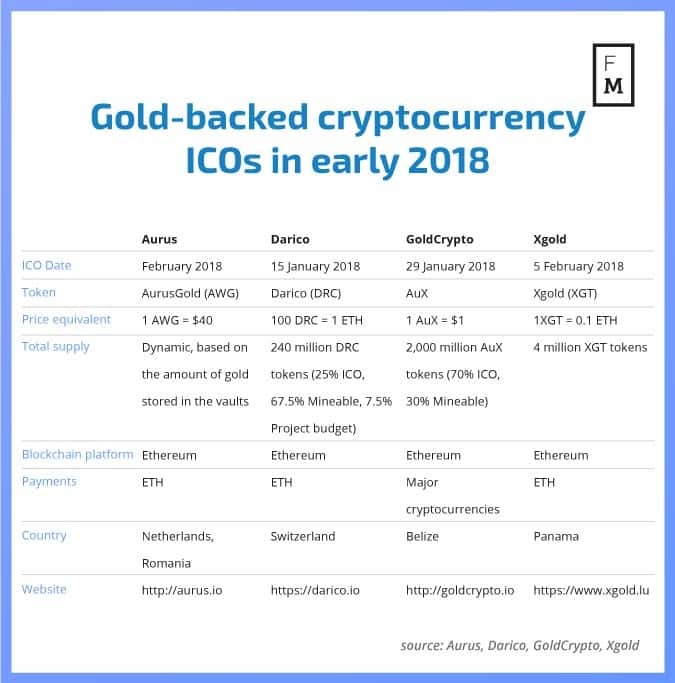 Unlike Aurus, Darico tokens are supported not only by gold (35 percent), but also by Ethereum (10 percent) and Bitcoin (55 percent). That unique mix should allow traders to take advantage of the gold prices stability in the longer run and the current dynamic growth of the two biggest and most popular cryptocurrencies. Thanks to the asset basket, DRC tokens should have low correlation with other digital coins, guaranteeing safer trading than other alternatives. In addition to the currency itself, Darico also provides wallet enabling crypto trading for non-technical users and debit card for payments. The whole project is developed by a team of nine individuals, with Mojtaba Asadian acting as its Founder and CEO. He has contributed a vast amount of international investment and wealth management knowledge to the Darico roadmap. GoldCrypto wants to establish AuX tokens as a unique gold standard that’s a decentralized and nationless cryptocurrency backed by physical gold. The option to exchange tokens for physical gold should be presented after July1, 2023. In the first phases of the project, each of 750 AuX tokens will be backed by one ounce of gold (approx. $1.70 per AuX). The team behind the project consists of key five individuals connected previously with the cryptocurrency and gold markets – Darcy Johnston, Peter Bartleet, Brian Golter, Christopher Nicols and Iman Bahrani. Furthermore, GoldCrypto’s operations are supported by the following parties: Crypto Investor Inc., Key Capital Corporation, Scottsdale Mint LLP and Interactive Brokers Group. XGold Corporation is a psychical gold production company that owns interests in various production mines. Thanks to this, the XGold Coin’s (XGC) pricing is based on a single gram of gold. The company operates by “buying and selling” gold bullion and the profit made on the transaction is reinvested in the purchase of more commodity assets. The founder and current president of the XGold, Dan Lazarus, has over fifteen years of experience in the field of gold and diamond mining. The whole team consists of more than ten people connected with the commodity and blockchain markets. Four ICOs that will steal gold’s shine in 2018? The main crowdsale of each of the above projects begins in early 2018. In the case of some of them in particular, there is also a chance to participate in a pre-ICO. Although each project wants to offer a gold-backed cryptocurrency, the solutions used, the concept and composition of the asset portfolio backing the issued tokens value differ from each other. According to the Finance Magnates Intelligence Department, the described ICOs deserve a stable note (based on the rating scale from 0 to 5) before their official launch. However, before any investment decisions are made, it is necessary to read the information about each individual project on its official website and inside the whitepaper.